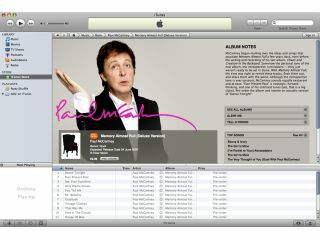 Not even a month has passed since the launch of iTunes Plus , but initial sales figures show that DRM-free music is selling better than expected. Now it's probably just a question of time before other record companies start to follow EMI . In late May, Apple started offering EMI's back catalogue on its iTunes Plus service. The music is of a higher sound quality and comes without copy protection. Sales figures so far seem to indicate that music fans may prefer DRM-free tunes. Sales of Classic Pink Floyd album Dark Side of the Moon are currently up 350 per cent, compared to before the launch of iTunes Plus, said EMI's digital senior vice president Lauren Berkowitz at a US music industry event. The sale of older albums provides a good benchmark to see whether people prefer tracks and albums with or without DRM. "The initial results of DRM-free music are good," Berkowitz said. Overall, people seem more likely to buy an entire album than single tracks when they have the chance to buy DRM-free music. EMI's three main rivals, Universal , Warner and Sony/BMG , have opted to wait to see how successful DRM-free music is among music fans. It seems they are likely to follow EMI and cash in on the DRM-free trend.